PixelACHE Audiovisual Club in Stockholm premieres one of the most ambitious productions of this year's festival, audiovisual ambient concertGrey Zone : Weathermatrix by Finnish artist collective CNCD. The night also features Digital vs Analog Soundclash [UK vs FI], a collaboration project between Mukul [UK] andTuomas Toivonen [FI]. This project experiments with the improvisation possibilities of analog and digital intruments, all sound and programming is done live. PixelACHE Audiovisual Club is the first chance to see material from upcoming DIN AV DVD, a project by visomat inc. from Berlin. 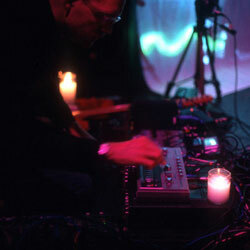 Project presents collaborations between artists working with electronic sound and visual media. Läder [SE] will be playing 'ringmodulated deathjazz on top volume' and the night also features DJ Coolof [SE] from Swedish band The Knife and visuals by TeemuK / Amfibio [FI].